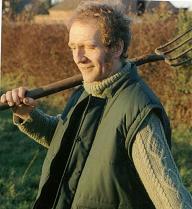 Alf Morris was a great man who will be sadly missed. 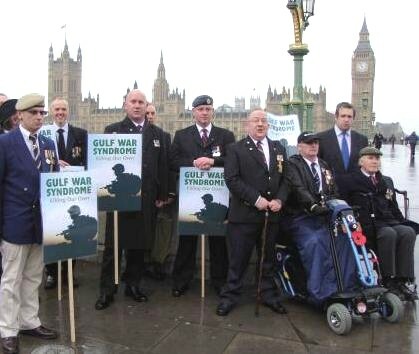 I went to the Gulf War Illness symposium he organised at the House of Lords 24th March 2009. He had arranged for US experts to come over to explain their findings that the illness is caused by pyridostigmine bromide and organophosphates. The Ministry of Defence didn’t attend; they later denied getting the invitation in time despite sending a Written Answer to MP Paul Tyler saying that it had been given too little notice. Two letters had also been sent a month before the meeting to Lady Taylor, Minister for International Defence and Security, and the Veterans Minister, MP Kevan Jones. We wish that he had! In the House of Lords there is an inner sanctum called the Queen’s Robing room (where successive monarchs have prepared for the state opening of parliament) exquisitely decorated with scenes from Arthurian legend depicting the virtues of Courtesy, Religion, Generosity, Hospitality and Mercy. It must have witnessed many interesting sights through the years, but probably none more remarkable than the visit of three members of the US Research Advisory Committee on Gulf war Veterans’ Illness last week; their journey to be there and mine have very separate beginnings. For me it was another journey on the quest for the missing shepherds. Some years ago an Anglican priest told me he was conducting too many funerals for people far too young to die and, as I looked around for those I knew from childhood, many had aged before their time and some suffering from inexplicable ailments. The commonest explanation offered was they were being affected by the chemicals in the sheep dip, in particular organophosphates (OPs) which are known as nerve toxins They had been developed in Germany in the second world war as pesticides and then refined as chemical weapons (at the end of the war the UK, US and Russia discovered this research and each developed their own weapons and pesticides). However first MAFF and now DEFRA insist that the new generations of OP pesticides are safe provided they are used according to instructions because their toxicity has been reduced. Our US visitors had been on a very different quest with a far more successful result. What had been puzzling them is why so many of their veterans of the Gulf War (1990-91) were now in broken health, at least 175,000 of the 697,000 troops deployed were experiencing a range of symptoms with no known cause. It had proved to be one of the most challenging pieces of medical detective work in recent times – not just because of the wide range of symptoms but also because of the long list of possible causes, everything from the oil well fires, fall-out blowing up chemical weapon dumps and the use of depleted uranium had made it one of the most toxic wars in history. However by a very detailed analysis they were able to ascertain Gulf War Illness was a real condition with two known causes: pills given to protect the troops from effects of nerve agents (known to our troops as NAPs with active ingredient pyridostigmine bromide (PB) a carbamate very closely related in action to OPs) and the insecticides they used to keep pest-borne diseases away many of which were OPs. All are neurotoxic explained in ways that go far beyond my medical understanding but even a layman like myself could see the damage revealed by the sophisticated brain-imaging techniques they had developed (damage that doesn’t show up on a normal MRI scan). They were able to show why problems of that type ought to be treatable (because again in layman’s terms the damage was to the ‘insulation’ of the fibres of the brain rather than the ‘wires’ themselves) and able to explain why some people exposed to similar levels of OPs can remain unaffected (by having high levels of the enzyme PON1 in the blood) which also gives a clue to possible prevention. There seems to be a different approach to unexplained medical conditions on either side of the Atlantic. Over here we tend to trivialise such things by either denying that they exist or shrug our shoulders and say nothing can be done; over there when reports came through that veterans were suffering doctors were ordered to find a cure. The US has already spent about $400m on investigating Gulf War Illness most of which is new research . . . In contrast the UK with 5,000 reported cases spent less than £25k on a review of the medical research of which about £17k was on hotel and travel costs. Such is the supremacy of US know-how in this area that we had to invite their academics over here to point out that our institutions are failing to give a duty of care to those brave men and women who volunteer for service. There is a not very PC joke about Canada being the country that could have had the best of everything – British tradition, American know-how and French culture but sadly ended up with French tradition, British know-how and American culture. Frankly we could have used a bit of Gallic unreasonableness in the room that day; if a French farmers’ leader such as Jose Bové had been there I expect he would have barricaded the doors, staged a sit-in and the issue may have been much nearer resolution before the day was out. But that is not the British (or American) way and many may have to suffer for a while longer yet. Unfortunately while their conditions are wrongly diagnosed some are prescribed the sort of medication that can make their condition worse, some in despair turn to suicide and, as far as I am aware, because lessons have not yet been learned, our armed forces in similar circumstances would again be exposed to the same cocktail of chemicals. However with so many of the great and good gathered there it gave me cause for optimism. For a start there is the Countess of Mar, an OP victim herself but with an indomitable campaigning spirit. Next to her was Lord Lloyd of Berwick who chaired the Independent Inquiry into Gulf War Illness that the government continues to ignore (resplendent in a tie covered in sheep which I presume was a political statement rather than a fashion one). The event had been organized by Lord Morris of Manchester (the first Minister for the Disabled anywhere in the world and a tireless campaigner on their behalf) and closed with a rousing speech by Lord Craig of Radley (Marshal of the RAF and Chief of the Defence Staff in the First Gulf War) who was critical that no-one from the MoD (or for that matter the official opposition) had bothered to attend. Many of our leading academics in the field were also there such as Prof Malcolm Hooper, Dr Sarah Mackenzie-Ross and Dr Stephen Hodges, all in their own way modern-day exponents of Arthurian virtue. Tom adds: “If you or anyone you know has been affected by the issues raised please do get in touch”. excellent I am very gratefulto tomfor his help on behalf of the shepherds. Another dipping season now starting and shepherds are still not being properly informed., stupidity on the part of our government, ywenty years ago I had to seek help from tthe E.P.A.in Washington. the B.M.A.. PUBLISHED THE FULL DETAILS OF ORGANOPHOSPHATE POISONING IN THEIR 2009 EDITION … MEDICAL DICTIONARY OF DISEASES. TOO LITTLE AND TOO LATE BUT IT IS A START. Hi my name is Peter I was poisoned about 94 whilst perusing a college coarse in agriculture.ops ruined my life and dreams and as far as help goes it is not there. Even though I was being educated by a college I was not warned if the dangers and them there selves placed me in danger of exposure. I don’t seem compensation for what has happened but I would like recognition and the right treatment. I’m behind this cause all the way no matter what. Is Cornell’s Alliance for Science ‘brainwashing Indian scientists, farmers, decision-makers’ or ‘captivating the world’?